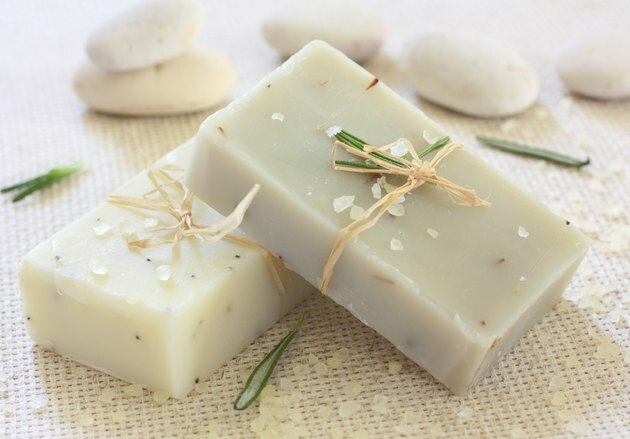 All soaps require a saponification process, which is the process of blending lye and fat under certain conditions. Hypoallergenic soaps contain minuscule amounts of chemicals, fragrances, colorings or other additives that may provoke allergic reactions in people with sensitive skin. Goat's milk is protein-rich and hypoallergenic. In fact, soap made from goat's milk is considered to be among the purest and gentlest soaps you can make.Check with your health care professional for advice if skin irritation persists after switching to hypoallergenic soaps. Combine 10 cups of goat's milk with 10 ½ ounces of lye in a large earthenware bowl or enamel pot. Stir carefully with a wooden spoon; the mixture will generate heat. Set the mixture aside until it cools to 85 degrees Fahrenheit. Mix 6 ounces of glycerin and 8 teaspoons of sodium borate into the cooled mixture. Warm 3 ½ pounds of lard to 90 degrees Fahrenheit. Add the warm lard to the hypoallergenic soap mixture. Set beaters to low speed. Beat for 15 minutes, scraping the bowl's sides occasionally with a wooden spoon. Allow the whipped hypoallergenic soap mixture to stand for five minutes. Beat again for 15 minutes on low speed. Let the mixture stand again for five minutes. Beat the hypoallergenic soap mixture on low for five minutes. Pour the thickening mixture into a soap mold or a glass pan. Allow the soap to harden for at least 24 hours. Invert the mold or pan to remove the hypoallergenic soap. Cut into bars. Store uncovered in a dry, warm place for at least one month to air dry before use. For greater sudsing power, add a little crushed soapwort or other saponin-producing plant, such as sweet pepperbush, to your soap. The longer your hypoallergenic soap ages before use, the better. Wait at least four weeks before using your soaps. Lye is caustic and can burn unprotected skin. Always mix your lye and fats in a ventilated room. Is Meringue Safe to Eat?